Looking for a new casual video game for your PC to pass the time? Then we might have something for you in the name of Just Roll It. We have a full written review below and a video accompaniment to watch how the game is played. Check out the embedded video above and read up below! If you’re not familiar, Just Roll It is pretty much a game called Modoo Marble in other countries and its pretty much an online board game based very closely to Monopoly. True to the name, you roll the dice and control your avatar around a board with places you can buy and set up houses, hotels, and landmarks. 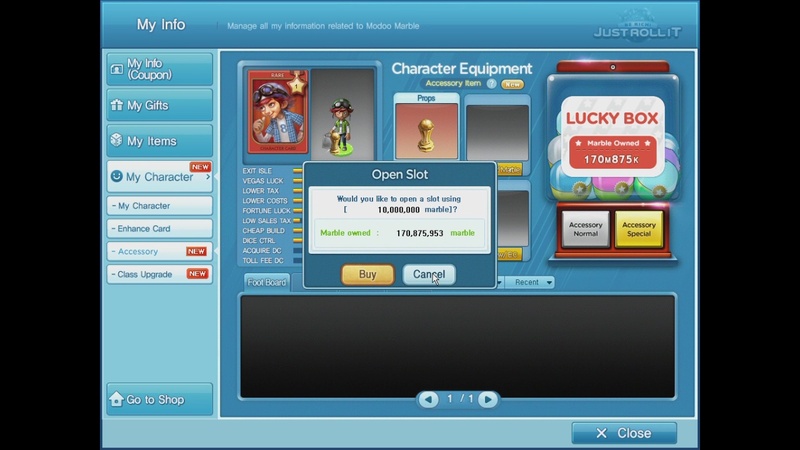 2-4 players online take turns buying properties, paying rent, buying other player’s properties, or doing whatever chance option there is on the board. You win by either bankrupting enemy players, monopolizing parts of the board, or having the most assets when the time limit ends. Pretty simple really. What makes just roll it a little bit more special is that you actually use a bit of your own virtual money that you can earn by logging in everyday, winning games, playing their other micro games, or putting in some real world currency. This money also ties in to your avatar’s level, dice rolls, and accessories in a way – as all these items play somewhat of a role in the game. Avatars and items have specific stats that either increase tolls received, decreases tolls paid, better dice rolls, and what not. While this might seem to give paying players an advantage, in our experience the game is random enough to give newbies a decent chance while still having fun. Plus, assuming you play often enough to get decent rewards, you’ll be able to collect higher level avatars and items on your own. Gameplay-wise we find nothing to complain about in Just Roll It and find it enjoyable most of the time. Its a great game to log into while waiting for friends at a net cafe; or a nice casual game to introduce to your (gaming and non-gaming) friends and family. While it does take a while to grind for higher level stuff – and there’s the constant reminder that you can pay real money to progress faster – it’s core gameplay still remains fun enough to keep you going. As far as the gaming client goes, its a relatively small 200mb download and runs well on even low spec computers. While we found no fault in the UI and graphics department, the voice acting in the game is pretty bland. Gameclub, who handles this game and several others including popular FPS Crossfire must have done a hasty localization job for the voices. Good thing there seems to be an option for more voices in the future. Also, we had some trouble with getting the client to run in full screen and played it entirely on a window – with an open browser next to it while waiting for our turn. Overall, we think Gameclub’s take on Monopoly is an earnest and playable take on the classic board game. While it’s rough on some edges, and sometimes its hard to find a game at off peak hours, we’ll definitely keep it around and play some more games when we have some downtime. 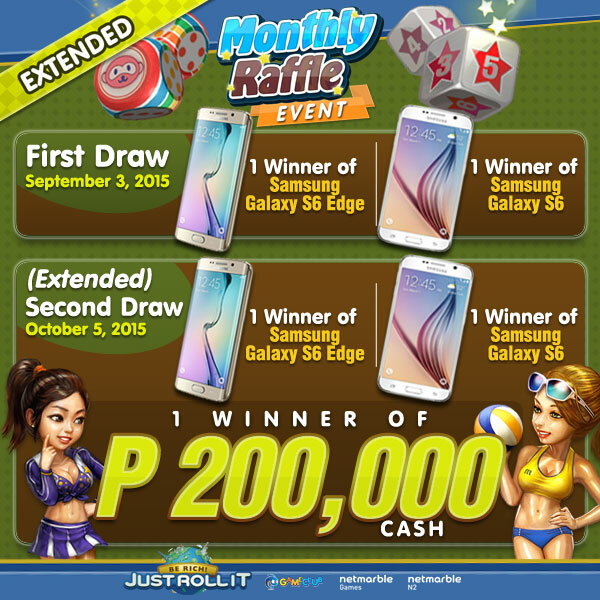 Lastly if you need more incentives to play, Gameclub is giving away real prizes for playing – with this September’s loot being Samsung S6 smartphones, or 200k cash. Link to the mechanics are here! Oh and if you need a link to the game’s website its http://JustRollIt.Ph!